A gas explosion late Friday afternoon damaged an underground utility vault, sent flames shooting through a sidewalk and prompted the evacuation of two apartment buildings in the Westlake district. 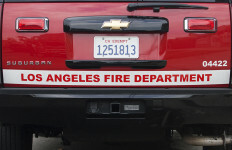 Firefighters responded about 6:15 p.m. to the area of Seventh Street and Westlake avenue and found flames and smoke coming through a sidewalk, according to Brian Humphrey of the Los Angeles Fire Department. No injuries were reported, but an odor of gas prompted the precautionary evacuation of a 42-unit apartment building in the 700 block of Westlake Avenue and later of a second three-story apartment building, this one with 32 units, in the same block, Humphrey said. Hazardous materials crews located a damaged underground vault across the street from the apartment building, Humphrey said. Westlake Avenue was closed between Seventh and Eighth streets and was expected to remain that way until fire department operations at the scene are complete, Humphrey said.